Napa Valley. 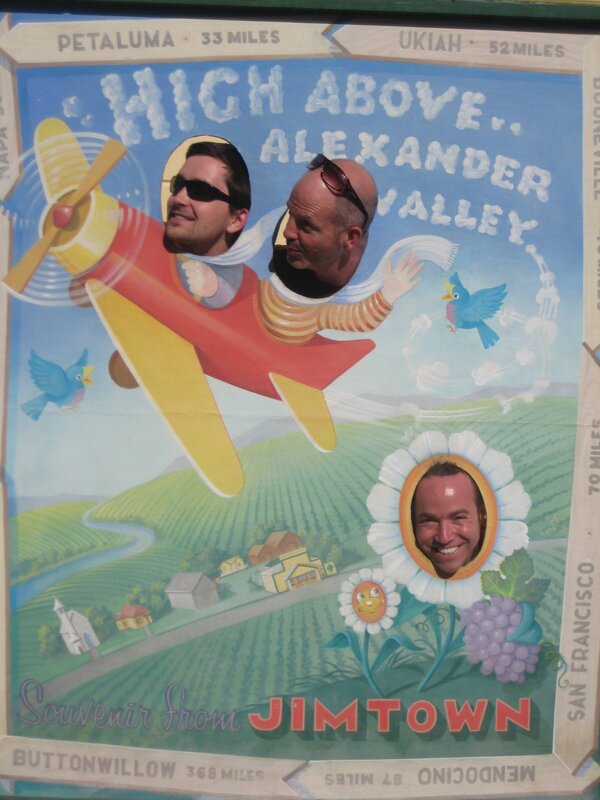 We went to Napa Valley on Saturday and stopped in at four wineries. Napa has always been a big touristy messfest, but it's gotten worse recently. Of course, now all of the wineries charge about $10 for a tasting. They used to be free. We first sauntered into V Sattui. I went with one purpose in mind: Gamay Rouge. This wine brings back grad school to me. And always reminds me of broken bottles. I think my friend Alisa bought some and broke it, spilling that Robitussin-colored wine all over a car. And Jim bought some and broke it, spilling that stuff all over the sidewalk. And Mark bought some and broke it. Maybe it's bad luck or something, but now pink wines are back in vogue, and I figured I'd splurge on a couple of bottles and try not to break them. The winery itself was like being at a food-frenzy tacky wedding of some relatives you're not particularly fond of. So many people, all shoving their glasses to the front of the counter for a taste, paying their ten bucks and then scooping up a bunch of bottles with a block of cheese and some baby clothes before going outside to the barbecue. We bought the wine after giving up on the tasting lines and made a run for it. My previous experiences at Merryvale had been good, but this St. Helena winery lost it's luster for me. The guy pouring for us was drab, dribbling very small tastes into our empty goblets for which we had agreed to pay their tasting fee. The reserve wines were very good, but we left without much satisfaction, not feeling warmly welcomed here, even after I tried to lavish guarded praise on the winery. Peju was absurd. It has a dumb name -- that's for sure. And inside the French-inspired chateau was an orderly queue of white people waiting for white wine. I dipped a pretzel in an open jar of cranberry mustard at the condimento display and caught up with Brad, who was dashing to flee this place. Perhaps he wanted to get back out to that exquisite sculpture garden. The mustard was delicious. Can't speak for the wine. Finally, we found we could purchase love. Alpha Omega. It's a new winery sandwiched among all of these other behemoths. For ten bucks, a visitor is invited to sample their four wines. Unlike the other wineries, if you buy a bottle of Alpha Omega, the tasting fee disappears. We politely stood at the counter as the friendly 50-something year-old woman who told us about her chef training in London and her MBA and her 'previous life' as a teacher poured four glasses for each of us. These were generous pours, perfect to soften us up for a purchase of their $60 red. And enjoyable they were, from the tropical sauvignon blanc to the earthy chardonnay and then to the zesty (is that a bad word to describe wine?) cabernet. She served a sliver of chocolate fudge as we swigged the cabernet. She reminded us to savor the soft mingling of chocolate and wine. Brad later remarked he would have been far more impressed with the winery if they had not also sold that fudgy stuff. It cheapened the experience for him. It's interesting how friendly sales banter can close the deal. We heard about the owner and France and the marketing manager who is from Georgia ("She's a former Miss Georgia, but she's actually smart"). We heard about her son in college, about the remodel to the winery, about the wine club and how their wines were destined for greatness. She showed the list of the 10 or so wines from Napa that had received a perfect 100 score from Wine Spectator over the last dozen years. I don't remember much of it because I was pretty tipsy at this point and looking forward to getting a malt down the highway at Taylor's. But we left with an easy $40 bottle of chardonnay, a little loopy, excited to be a part of the in-crowd, in-the-know about Alpha Omega and its predetermined superiority.